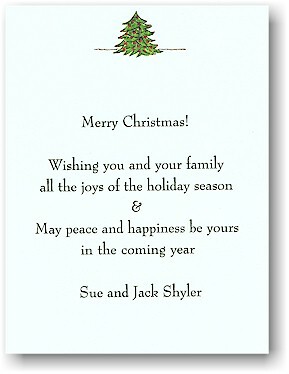 Cream-colored flat card with Christmas tree at top center. Perfect to use as a holiday invitation or to send holiday wishes. Cream, Pink, Blue, Yellow, Purple, Red or Green envelopes available. Your return address can be printed on the back of the envelope flaps for an additional fee.